What are the current requirements for sign retroreflectivity? Note: The compliance date of June 13, 2014 applies only to the implementation and continued use of an assessment or management method that is designed to maintain regulatory and warning sign retroreflectivity at or above the minimum retroreflectivity levels in Table 2A-3. Agencies are expected to add signs other than regulatory or warning to their method as resources allow. Does the MUTCD still require replacing signs based on the minimum retroreflectivity levels? Yes, although there is no compliance date for sign replacement. Even though FHWA issued a final rule in 2012 eliminating most specific compliance dates, signs identified through an agency's method as being below the minimum established retroreflectivity levels have exhausted their useful service life. Such signs do not meet the needed function of being adequately visible at night; therefore; they need to be replaced. Schedules for replacing the signs are based on resources and relative priorities. When do signs not meeting minimum retroreflectivity need to be replaced? Similar to other occurrences of signs that are no longer serviceable, agencies are expected to prioritize replacement of these signs based on engineering considerations such as the relative importance of the sign to the safety of the road user, volumes and speed of nighttime traffic, and optimal use of limited resources, among others. Signs that are no longer serviceable might demand a higher priority for replacement over other non-compliant signs that are replaced by systematic upgrading or routine maintenance schedules. Accordingly, it is expected that the use of the assessment or management method would serve to identify and program the replacement of signs that are found to be or expected to be below the minimum retroreflectivity levels. When do guide signs, including street name signs, need to meet the minimum retroreflectivity requirements? The compliance date for implementation and continued use of a method for guide signs (including street name signs) has been eliminated. However, agencies are expected to add these signs to their method as resources allow. Are signs on private roadways included in the requirements? Yes. Private roads open to public travel are required to meet provisions of the MUTCD, including the minimum retroreflectivity standards. What happens if an agency does not develop a method to comply with the MUTCD? Whether or not related to retroreflectivity, an agency that does not comply with provisions in the MUTCD faces the potential for tort liability and may have to defend its decisions. The FHWA does not monitor agencies' application of the MUTCD for compliance; however, there is potential that Federal-aid would be denied to agencies that are not in compliance with Federal regulations. What if an application or sheeting color combination is not included in Table 2A-3? Object markers are important warning traffic control devices. While they are not specifically included in Section 2A.08 (object markers were in Part 3 at the time of the sign retroreflectivity rulemaking), the absence of a minimum retroreflectivity requirement does not override the need to be retroreflective or illuminated (per Section 2A.07). Highway agencies that choose to include object markers in their retroreflectivity maintenance method could use the minimum retroreflectivity levels designated for bold symbol signs for object markers with yellow sign sheeting. Object markers that contain reflector "buttons" are not required to meet minimum retroreflectivity levels. When the minimum retroreflectivity levels were developed, they were not designed to include devices with red-only sign sheeting, such as the sheeting used for OM4-3 object markers. Fluorescent yellow and fluorescent yellow-green signs need to meet the minimum retroreflectivity levels for yellow signs, and fluorescent orange signs need to meet the minimum retroreflectivity levels for orange signs. While there are several different applications where this issue arises, for the most part, white on red or red on white may be treated the same unless the sign type is included in the list of exempt signs. 1) A YIELD sign is treated as white on red. 2) The retroreflectivity of signs with a red circle and slash indicating turning or other prohibitions is open to interpretation, because they have both a black and red legend on a white background. However, FHWA suggests using the white on red retroreflectivity levels and contrast ratio since the red legend is providing the overriding message that the movement is prohibited. FHWA suggests treating white on black signs the same as black on white. A number of assigned and unassigned colors listed in Section 1A.12 are not included in Table 2A-3. Signs with blue and brown backgrounds are specifically mentioned in the exempt list, but this exemption also applies to other colors not included in the Table, such as purple, light blue and coral. None of these colors was included in the research at the time of sign retroreflectivity rulemaking. However, the research on recommended minimum levels for white on blue and white on brown has since been completed (Publication No. FHWA-HRT-08-029). FHWA has also provided a guidance memorandum indicating it remains the option of the agency having jurisdiction to consider the recommended minimum values as they monitor, install and replace these signs. This option allows an agency the flexibility to implement minimum retroreflectivity levels on specific signs they consider more important than others, such as hospital or interstate route shield signs. The minimum retroreflectivity levels for the colors of signs used as symbols within other signs is left to the interpretation of each agency with the exception of the special cases listed in Table 2A-3. Similarly, signs with colors used in an atypical manner (or out-of-context) are left to engineering judgment. Activated signs such as the W10-7 for trains are typically internally lit rather than static, and therefore do not need to be retroreflective. Will Table 2A-3 of the MUTCD be updated to reflect the new ASTM specifications, such as adding ASTM D4956 Type XI sheeting? Perhaps in the Future. Revising the table in the MUTCD must be done through the formal rulemaking process. FHWA will update the table in the MUTCD at an appropriate time. In the interim, agencies may use the minimum levels designated for all prismatic sheetings for ASTM D4956 Type XI prismatics. What are the key differences between the following two sign retroreflectivity specifications: ASTM D4956 and AASHTO M268? There are many similarities between ASTM D4956 and AASHTO M268. However, there are some key differences too. ASTM D4956 currently includes nine classifications or types of materials, and AASHTO M268 includes four types. ASTM D4956 is a QA/QC document covering sign sheeting materials and is used by many industries including DOTS but also many industries outside of transportation. AASHTO M268 is also a QA/QC document but it was developed specifically for retroreflective highway signs. The AASHTO specification addresses retroreflective performance of a finished sign, regardless of whether it is made with inks, digital printing, or overlays. ASTM D4956 is more like a catalog of retroreflective materials grouped into classifications without consistent distinctions between each classification. AASHTO M268 is closer to a performance based specification where there are meaningful relationships that distinguish the four different types. Neither specification provide recommendations link specific types of retroreflective materials to specific sign types. Why are there different minimum retroreflectivity levels for different sheeting types of the same color? Retroreflectometers measure at specific angles which are different from the actual angles involved in driving. The translation between what the driver needs and what is measured by the device varies for different types of sheeting, hence there are different minimum retroreflectivity levels for different types of sign sheeting. Do agencies have to develop an inventory of their signs to be in compliance with the MUTCD? No. Although a documented inventory (computer or other form) is very useful, there is no specific requirement in the MUTCD for an inventory. Each agency will need to determine whether a sign inventory is appropriate to help manage its signs. What resources are available to assist agencies with implementation? Research materials that provide more background or detailed information are also available. Local and tribal agencies are encouraged to contact their LTAP and TTAP representatives who have received training. They will be able to assist highway officials comply with the provisions in the MUTCD regarding sign retroreflectivity. If you need information beyond that available on this website or through our LTAP or TTAP representative, please contact your FHWA Division Office. How can agencies assure that they are meeting the requirements for retroreflectivity? Agencies will need to implement one of the five methods listed in the MUTCD, or a combination of the methods, to assess signs for nighttime visibility. These methods, described in Maintaining Traffic Sign Retroreflectivity, and the associated procedures tie the methods to the minimum required levels. An agency may decide to develop its own assessment or management method, as long as it is tied to the minimum retroreflectivity levels in Table 2A-3 and based on an engineering study. As long as the maintenance method is tied to the minimum levels, there may be some individual signs below the minimum levels for a period of time, but the agency is still considered to be in compliance as long as they have an acceptable method in place. Since the retroreflective properties of traffic control devices deteriorate over time, highway officials may want to assess their schedules for inspecting, cleaning, and replacing signs to ensure that these maintenance activities meet the provisions of the MUTCD, and more importantly, the needs of drivers at night. Additionally, it is important to have procurement processes that ensure that sign materials are being specified that offer retroreflectivity performance that meets or exceeds the minimum levels specified in the MUTCD. Do agencies have to submit their retroreflectivity documentation to FHWA for approval? No. FHWA does not require agencies to submit documentation – annually or under any other timeframe. An agency may choose to document their maintenance method and activities in managing sign retroreflectivity for their own purposes, such as scheduling, budgeting resources, defense against litigation, etc. For more information regarding Methods, please see the Technical Guidance and Implementation Tools which contain additional documents that you may find useful. What are the methods for assessing and maintaining traffic sign retroreflectivity? Other assessment or management methods that are developed based on engineering studies can be used as long as they are designed to maintain minimum levels in Table 2A-3 of the 2009 MUTCD, as stated in the MUTCD Standard statement in Section 2A.08. Which of the methods is preferred? There is no one best method for all agencies. All of the methods, and their associated procedures as outlined in Maintaining Traffic Sign Retroreflectivity, are tied to the minimum retroreflectivity values. They were developed to provide maximum flexibility for agencies. The best method for one agency may be different from the best method for another. However, a combination of methods is likely to result in overcoming disadvantages that any of the individual methods may have. How often should visual inspections be conducted and sign retroreflectivity be measured? There is no specific rule regarding how often to conduct inspections or take measurements. Each agency needs to determine how often to inspect or measure their signs. If using the measured sign retroreflectivity method, one element to consider is the type of sign sheeting used on the signs that are being evaluated. Newer prismatic materials may not need to be measured for several years, whereas older sheeting and sheeting made with glass beads may need to be measured more frequently as it approaches the minimum retroreflectivity level. Once an agency begins to inspect or measure its signs, it will have more data regarding the retroreflectivity levels, types of sheeting used, and other conditions upon which to determine the appropriate intervals for future inspections or measurements. There is no requirement for federal approval of an agency's method. An agency may choose to document their maintenance method and activities in managing sign retroreflectivity for their own purposes, such as scheduling, budgeting resources, defense against litigation, etc. Are there sign inventory programs available for local agencies to use? Yes. Local agencies are encouraged to check with their Local Technical Assistance Program (LTAP) Center to obtain asset management related information and resources. Several State DOTs have also been very active in assisting local agencies with sign retroreflectivity. If agencies do not have a contact person at their DOT, they can contact the local FHWA Division Office for assistance. Is a retroreflectometer required to meet the MUTCD requirements? No. A retroreflectometer is only needed to perform the measured sign retroreflectivity method or if using measured retroreflectivity to monitor expected sign life or control signs as part of a management method. However, access to a retroreflectometer may also be needed periodically to verify that calibration signs or comparison panels continue at or above the minimum retroreflectivity levels if these procedures are used as part of the visual nighttime inspection method. Occasional use of a retroreflectometer can also assist with quality checks of any of the MUTCD methods. Will frost or dew affect the retroreflectivity of my signs? Can mobile retroreflectometers be used to meet the requirements in 2A.08? Yes, but you should verify that the measurements are comparable to a handheld retroreflectometer. The use of mobile instrument technology does meet the MUTCD requirements, since Measured Sign Retroreflectivity is one of the maintenance methods listed in the MUTCD. The MUTCD standard does not distinguish between the use of handheld or mobile instruments. Are sign inspectors required to be trained? What is the definition of a "trained" inspector? Can on-the-job experience substitute for training? The MUTCD requires a trained inspector for visual nighttime inspection, but does not specify training requirements. It is important that the inspector understand how to perform the specific procedure in order to identify signs falling below or near the minimum retroreflectivity levels in Table 2A.3. Typically, on-the-job-experience alone does not substitute for training, since the inspector needs to understand the basics of retroreflection and the specifics of the chosen assessment method. Local and Tribal Technical Assistance Program (LTAP & TTAP) Centers are a primary source of training. Should inspectors be at least 60 years old? The consistent parameters procedure of the visual nighttime inspection method is the only procedure for which the inspector should be at least 60 years old. There are two alternative procedures that may be used with the visual nighttime inspection method that have no minimum age limit for inspectors. There is also no minimum age limit for the inspector using the measured sign retroreflectivity method. Can nighttime photos (photolog) or video be used to assess sign retroreflectivity? No, is currently recommended. Although work is progressing in this area, there is currently no known photo technology that can be used as a method to acturately assess or manage sign retroreflectivity for the purposes of meeting the MUTCD retroreflectivity requirements. Photography alone cannot represent actual retroreflectivity levels for signs in varying position, location, and retroreflective performance. In the future, if photo technology advances to have this capability, an agency could potentially develop such a method. The MUTCD does allow development of other methods, as long as they are based on engineering studies that tie the method to the minimum retroreflectivity levels. Thus, if photo technology advances and engineering studies support its adoption, then it may be used. Can signs be inspected during the day to avoid overtime costs associated with nighttime inspection? The measured sign retroreflectivity method can be performed in daylight. However, the visual nighttime inspection method listed in the MUTCD requires nighttime inspections. The MUTCD does allow development of other methods, as long as they are based on engineering study that ties the method to the minimum retroreflectivity levels. Can the comparison panels procedure be used in the daytime with a bright flashlight? The MUTCD does allow development of other methods, as long as they are based on engineering studies that tie the methods to the minimum retroreflectivity levels. Therefore, if an agency has an engineering study that shows that such a method would enable the agency to decide whether or not their signs are above the minimum retroreflectivity values, the agency may use that as an additional method. The agency would need to be willing to use the engineering study to defend the method and any questions that may arise. Can the sheeting warranty be used as the service life for sign retroreflectivity? The warranty period for specific sheeting is a good starting point for estimating service life. In many cases, the warranty is much less than the service life. Service life is affected by many factors such as the direction the sign faces and region of the country. Does the blanket replacement method relieve an agency of the need for sign maintenance between replacement cycles? No. Blanket replacement is a management method for maintaining sign retroreflectivity. Some agencies find that this is a desirable method because it is less intensive, requiring less manpower to maintain their compliance with the sign retroreflectivity requirements than the assessment methods. That does not relieve an agency of the other maintenance requirements for signs, such as repairing or replacing signs knocked down or vandalized, or trimming trees or other vegetation growth can interfere with the visibility of signs. Maintaining retroreflectivity is only one component of sign maintenance. The blanket replacement method seems like the easiest, why would anyone choose a different method? In comparison to the other methods, it may be less intensive, but some agencies may not find the blanket replacement method the most effective in fulfilling other maintenance requirement for signs (see answer to question immediately above this one). In addition, the blanket replacement method requires that all signs in a group (area, corridor, etc.) be replaced before they are below minimum retroreflectivity levels. As a result, some signs in the group may not yet be approaching the minimum retroreflectivity level, but they must be replaced when using the blanket replacement method. Can the control sign method be used as a standalone method? Yes, although part of this management method is to use an assessment method to monitor the control signs. The assessment methods are measured sign retroreflectivity and visual nighttime inspection. Can agencies still use Type I Engineering Grade sign sheeting for new signs? Yes. Although Type I Engineering Grade sheeting cannot be used for warning signs it may still be used for white, green, and red backgrounds. Type I Engineering Grade sign sheeting may also still be used for the white legend on a sign with a red background. Thus, STOP signs and black-on-white regulatory signs may still be made from Type I Engineering Grade sign sheeting. However, when agencies review their signing practices and their choice of sign materials, they may want to consider the annualized costs of the signs, using factors such as expected sign life. Even though a particular type of sheeting might initially meet the minimum retroreflectivity levels when it is new, the sheeting might quickly degrade to below the minimum retroreflectivity levels, thus losing its effectiveness at night and requiring replacement sooner. The use of higher performance sheeting, even though it has a higher initial cost, might provide a better life-cycle cost for the agency. Can in-service engineering grade warning signs with measured retroreflectivity values above 50/75 cd/lx/m2 remain in place? Yes, if the agency has measured their warning signs and the retroreflectivity measurements exceed the appropriate 50/75 cd/lx/m2 levels as shown in Table 2A-3, the signs may remain in place. If the retroreflectivity of the signs is measured to be below the minimum values, they should be replaced. What are the minimum retroreflectivity requirements for Type I prismatic sheeting? The requirements are the same as for Type I beaded sheeting. Sheeting that meets ASTM Type I is only required to meet the minimum requirements of the type, regardless of whether the material is beaded or prismatic sheeting. Can existing lighted overhead signs with Type III sheeting remain in place? Can agencies use any type of sign sheeting as long as its retroreflectivity meets the minimum retroreflectivity levels? It depends. Table 2A-3 of the MUTCD indicates that any type of sheeting including the Type I (commonly called Engineering Grade), Type II (commonly called Super Engineering Grade), or Type III beaded (commonly called High Intensity Beaded) sheeting and the Type III, IV, VI, VII, VIII, IX, or X prismatic sheeting may be used on any sign with the following exceptions: Types I, II, and III beaded sheeting cannot be used for the white legends on overhead guide signs; Type I beaded sheeting cannot be used for the white legends on ground-mounted guide signs; and Type I beaded sheeting cannot be used for the yellow or orange backgrounds on warning signs. What sheeting should I use? That choice must be made by the agency. One common mistake is considering only the retroreflectivity and cost at time of installation, rather than how long the sheeting will maintain a level of retroreflectivity above the minimum level. Agencies should weigh the initial costs for materials and installation against the expected lifetime of the material. How do agencies with Type XI sheeting meet the minimum retroreflectivity requirements, since there are no values in Table 2A-3? Agencies may use the values in Table 2A-3 for other types of prismatic sheeting. What is the difference between prismatic sheeting and microprismatic sheeting? The terms are used interchangeably. The ASTM test method uses the term microprismatic, which is the more appropriate term. For more information about traffic control devices and the MUTCD, please see FHWA's MUTCD website. Retroreflectivity is a term that is synonymous with the coefficient of retroreflectance, which is formally defined in ASTM E808. In general terms, retroreflectivity describes the efficiency of a material to redirect light back to its source. This is a unique form of the more common diffuse reflection, whereby light is scattered in all directions after striking an object. Retroreflective materials are engineered to redirect most of the light back toward the source, which gives signs and pavement markings a brighter appearance at night from the driver's perspective. Motorists experience the benefits of retroreflectivity whenever light from their headlights shines on traffic signs. Signs made with retroreflective sheeting materials appear to glow in the dark, making them easier to see. The sign's shape, color, and legend provide important information to motorists as they navigate the nation's highways, streets, and roads at night. What makes the traffic signs visible at night? Traffic signs are covered with retroreflective sheeting materials. These materials are usually made with tiny glass beads or with a very small, complex pattern of cube corners that work like prisms. Both of these types of retroreflective materials redirect light back towards its source, but the performance of the materials varies. Photographs of various sheeting patterns of both types are shown on the Retroreflective Sheeting Identification Guide produced by FHWA. Why is the FHWA concerned about the visibility of traffic signs at night? One of the FHWA's primary missions is to improve safety on the nation's roadways. Tens of thousands of men, women, and children have been killed annually on American roads over the past decade. While only one quarter of all travel occurs at night, about half of the traffic fatalities occur during nighttime hours. One of the primary reasons for this disparity is the lack of visual cues that indicate roadway curvature or other critical information to the driver. During daylight hours, visual cues include such things as shoulders, pavement markings, overhead and post-mounted signs, roadside vegetation, guardrails, fences, and buildings, which make navigation easier. At night, the driver must rely on overhead or sign lighting (when available) and the small amount of light that the headlamps provide. At typical highway speeds, headlamps provide very little illumination at the distances drivers need to make decisions. Retroreflective materials extend the capabilities of the headlamps, making the critical visual cues provided by signs, pavement markings, and delineators visible at much greater distances. While signs and markings installed by agencies typically have good retroreflective properties when they are installed, their performance degrades over time due to exposure to the elements. Adequately maintained retroreflective signs are critical to meeting the driver's visibility needs at night because they heighten motorists' understanding of the roadway, enhance traffic flow, and have the potential to improve highway safety. Nighttime visibility of traffic control devices is becoming increasingly important as our population ages. By the year 2020, about one-fifth of the U.S. population will be 65 years of age or older. In general, older individuals have declining vision and slower reaction times. Signs that are easier to see and read at night can help older drivers retain their freedom of mobility and remain independent. The recommendations and requirements for the retroreflectivity and/or illumination of signs at night are included in the MUTCD. 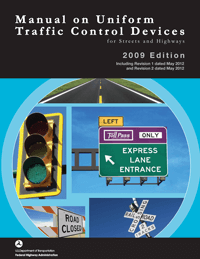 The Manual on Uniform Traffic Control Devices (MUTCD), which is published by the FHWA, is the national standard governing all traffic control devices. All public agencies and owners of private roads open to public travel across the Nation rely on the MUTCD to bring uniformity to the roadway. The MUTCD plays a critical role in providing safety and mobility for all road users. It is used by road managers nationwide to install and maintain traffic control devices on all streets and highways open to public travel. There are many standards for traffic signs beyond retroreflectivity in the MUTCD. For efficiencies, agencies often upgrade sign lettering, adjust the heights and offset of the signs, and replace supports that are not crashworthy at the same time they replace signs that no longer meet the minimum retroreflectivity level. How do local agencies receive funding assistance for sign retroreflectivity? Non-state agencies such as counties and municipalities should work through their designated Regional Planning Commissions (RPC), Regional Transportation Planning Organizations, (RPO or RTPO), Councils of Government (COG) or Metropolitan Planning Organizations (MPO) or the State DOT to identify, plan, and program transportation safety projects. The responsibility of prioritizing needs and securing eligible Federal funds for specific projects remains with each State DOT or MPO in partnership with the FHWA Division Office. Is federal funding available for inventorying or assessing sign retroreflectivity? An asset management activity, such as the development of a sign inventory, may be eligible for certain types of project and planning funds. Planning funds, which include State Planning and Research (SPR) and Metropolitan Planning (PL) funds, are eligible for studying and identifying systemwide retroreflectivity needs, but not for implementation or construction. Refer to 23 USC 134 (h) and 135(d) for additional information. Highway Safety Improvement Program (HSIP) and Surface Transportation Program (STP) funds may also be eligible for planning, inventory, and assessment of sign retroreflectivity.Ã‚Â Note that if you are planning for a project or a set of projects, this would be considered preliminary engineering and is therefore not eligible for SPR or PL funding, but should be funded through the same source as the project(s). Can I buy a retroreflectometer with federal funds? It depends. If it is part of an asset management activity, equipment purchase may be eligible. Is federal funding available for replacing signs that are below the minimum retroreflectivity level? Maintenance of traffic signs is primarily a responsibility of the owner agency that has jurisdiction on the roadway. While a variety of safety improvements, including signing, are eligible activities for the Highway Safety Improvement Program (HSIP), section 148 of title 23 U.S.C. outlines specific requirements for identifying and prioritizing projects. Data analysis is the foundation of the HSIP and should be the determining factor when making funding decisions and allocating resources. Safety funds are to be used on the most effective treatments at the locations with the greatest needs. Therefore, funding requests need to compete with other safety projects. If a project on a specific corridor is being funded with other Federal-aid funds (such as NHPP or STP), then the signs should be replaced with the same funding as that project.